So I got some old knitting books in the mail today - my mom is cleaning out her old books and I asked for anything old she didn't want. First Book of Modern Lace Knitting and Second Book of Modern Lace Knitting, as well some old Patron's baby's pamphlets and something from Jack Frost. Holy cow, people really used to knit for YEARS on these things with incredibly tiny yarn. I'm thinking I'll see if I can adapt something from the Modern Lace books for the peacock. 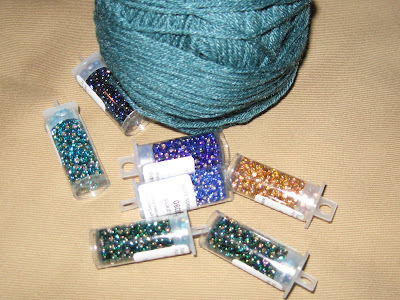 I swatched it, but wasn't happy - yarn overs with all those colors of beads just got muddy, so back to the drawing board. So once again, I'm working on too many things at the same time and it's spring - yes, mowing the yard starts in MARCH down here in the great southeast - and little league is in full swing again. 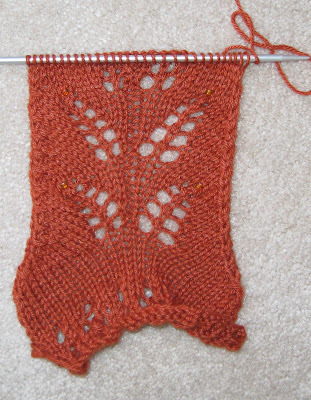 However, Rosa Rugosa (from Knitting the New Classics) is perfect. I'm using Comfy, in Fedora, and it's lovely and soft (hopefully it will wash well, the linen stitch pullover has worked out so far) and I'm not going to do the colored flower intarsia on the fronts, so it is perfect for knitting while watching games and practices. Boring to photograph, tho' sorry. I also started the second half of Bittersweet - it's going to be worked in 2 halves and then grafted together at the end. But it isn't worth taking a picture of right now, it just looks like all the other pictures. So last year I wanted to spin a peacock, which turned into a dragon, but that's fine. Well, now I want to make a lace yarn over pattern shawl like peacock feathers. Here are my raw materials. I'm so excited. I have the chart and everything, I just have to do some test swatching, see if it lives or not. Of course, that was not to happen last night, because I spent most of my evening taking apart the bathroom sink. But here are some pictures of Bittersweet. 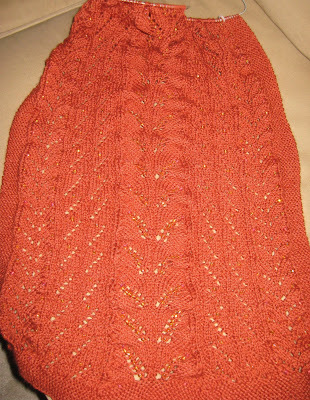 The pattern is basically done, but the shawl is only half finished. 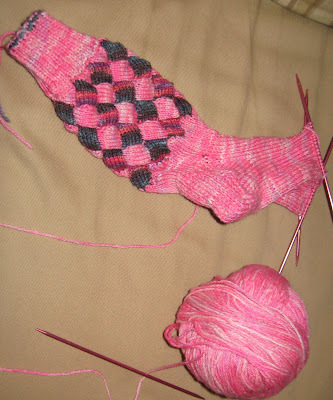 The plan is to knit each half separately and then kitchner them together in the middle. Pattern should be available next week, along with some finished pictures. And the best part, it's kitty-approved (see last picture). These aren't the best snaps ever, I'll try taking some outside this week. I'm using Gloss in Pumpkin, with orange and red size 6 beads. 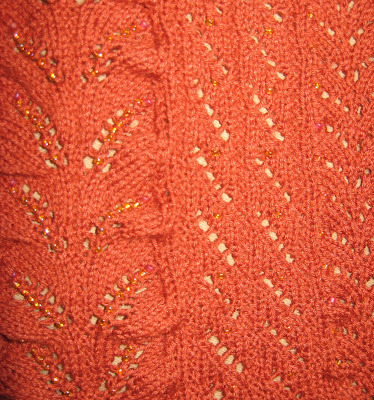 The colors and the climbing patterns remind me of bittersweet - I started designing this with the idea of something with leaves, because the color was so autumnal. I can also see redesigning this into a cardigan pattern, I think it's interesting enough and uses beads sparingly enough. See if you agree with me - I should have a picture loaded later today/this evening. 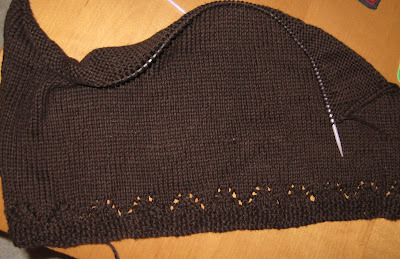 It's a test for the shawl, but I have an idea for a cardigan also . . .
Beads are a little hard to see. Had quite a weekend for finishing things. 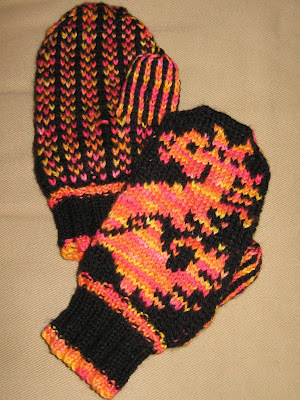 The little one's mittens (which we needed because of the 4 inches of snow!) 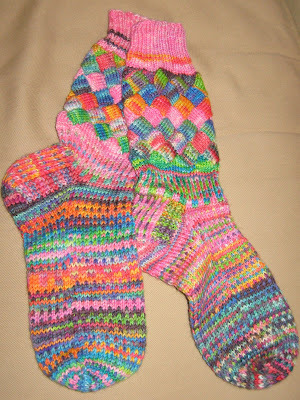 the lined mittens finally got the rest of their embroidery and the entrelac socks are done. So I started a new pair. Next stop, knitting some swatches of the latest shawl design.